Something of a bus dodger are we, Sir? Then try the Kawasaki KH125 for your daily commute. Kawasaki KH125 costs buttons to buy and run, reliable and has just enough power to stick with urban traffic. 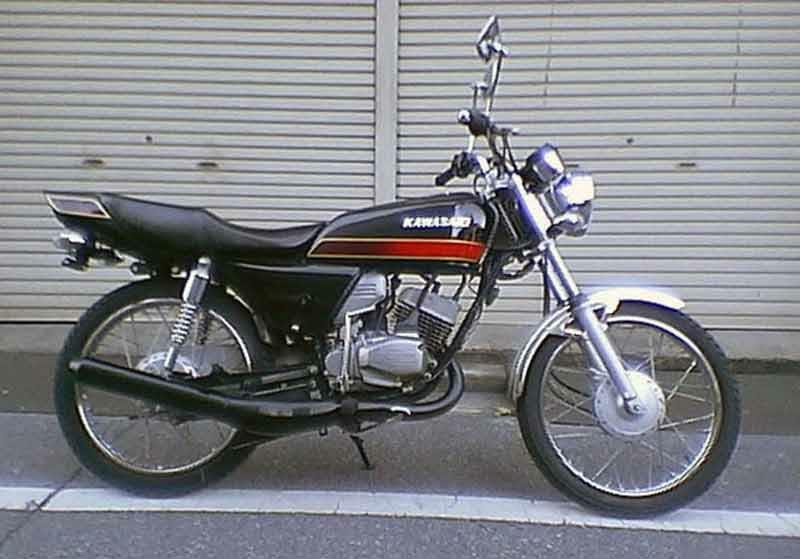 The Kawasaki KH125 looks a bit dated now and it's a low tech two-stroke, but still a fun way to get to work. 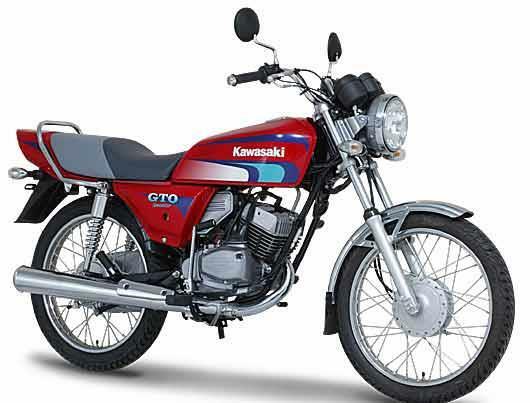 Kawasaki KH125 early models had fairly basic suspension, with fully enclosed forks and shock absorbers - ironically, these items tended to wear better than the post 1983 Kawasaki KH125 models, with exposed telescopic forks and shock springs. aKawasaki KH125 hndling is what you'd expect for a commuter - nothing special, an unpretentious lightweight. Once the rotary valve Kawasaki singles were class leading performers, but that was three decades ago and now the KH100/Kawasaki KH125 motor seems a bit vibey, harsh at speed and simply runs out of steam on the open road. 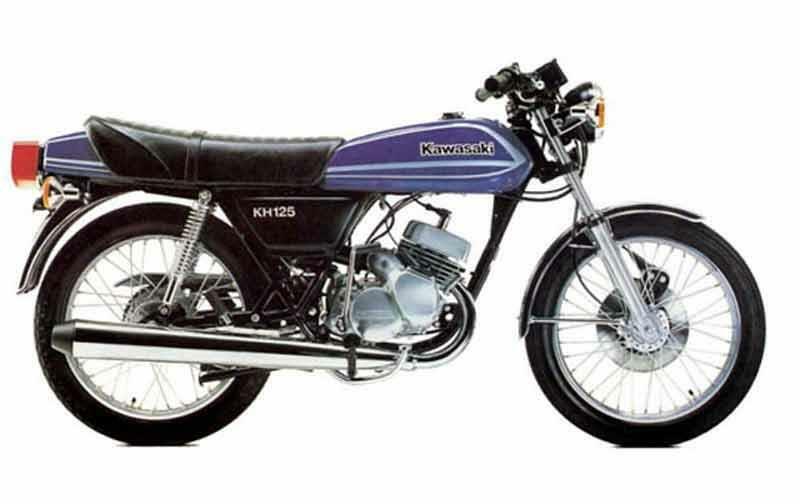 The Kawasaki KH125 is very durable for a two stroke however and worth noting that the KH100 makes almost exactly the same bhp as the Kawasaki KH125. The Kawasaki KH125 engines are renowned for their tough durability and the bike chassis wears OK too. With a twenty year production run spares aren't too bad for the Kawasaki KH125, although vulnerable items like clocks, the unique square headlight and chrome plated mudguards are getting scarce now. 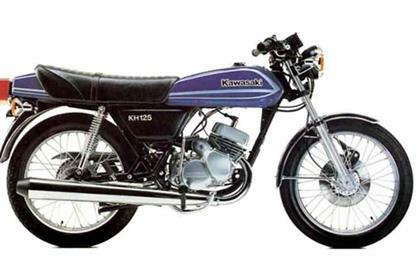 The Kawasaki KH125 was created in an era when the Japanese factories dominated the ride-to-work market. Bikes like the Kawasaki KH125 were meant to survive daily use, enjoy very little maintenance and return 65mpg at a steady 55mph. Even a battered example can still get you home, eventually. Find a Kawasaki KH125 for sale. 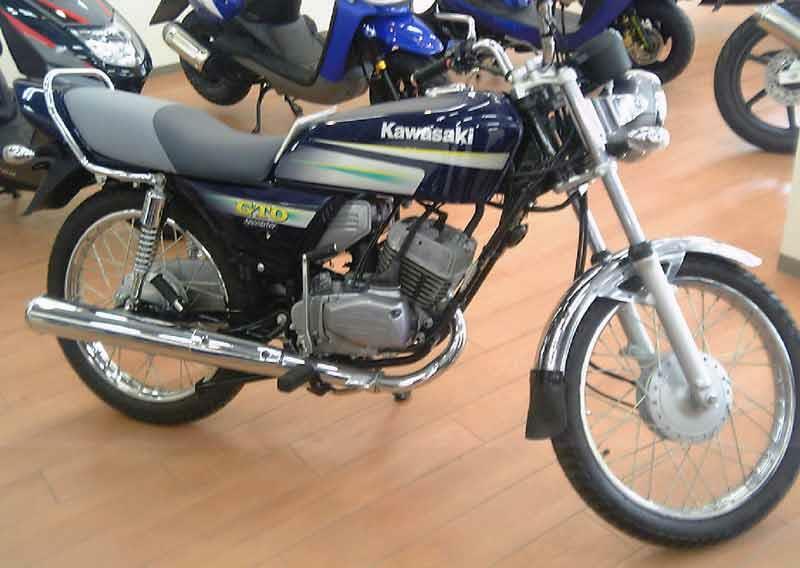 When it was launched the Kawasaki KH125 was a novelty as it featured a front disc brake - the KH100 of the late 70s had a basic drum front brake, before gaining a disc in the early 80s, along with five spoke cast alloy wheels. Kawasaki KH125 has a decent saddle, handy grabrail, but lacks any mirrors as standard. 1975: Kawasaki KH125 appears in UK. 1976: KH100 launched in UK. 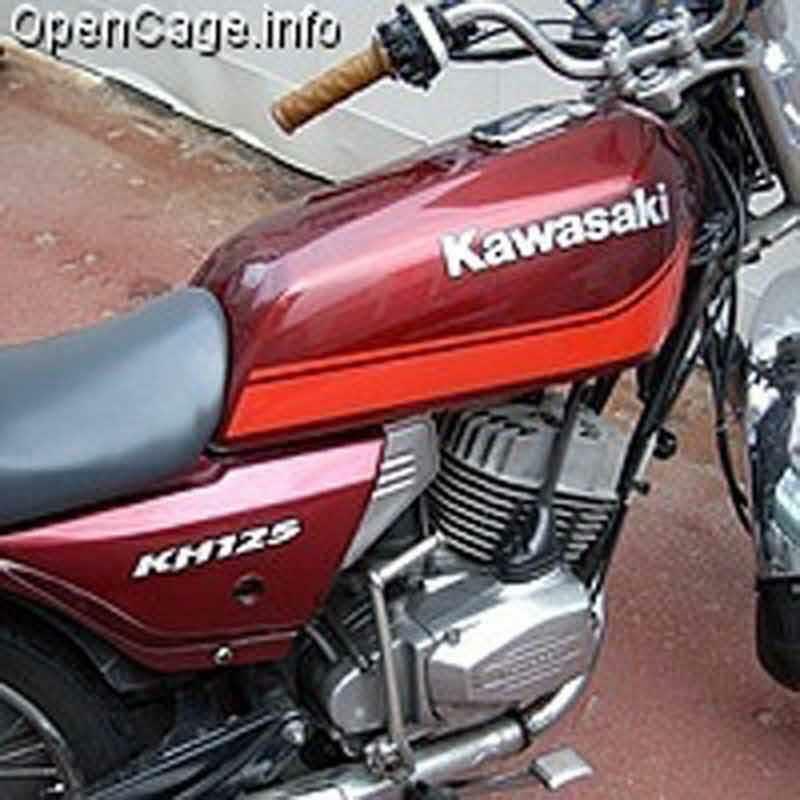 4 owners have reviewed their KAWASAKI KH125 (1975-1998) and rated it in a number of areas. Read what they have to say and what they like and dislike about the bike below. I have a 25 year old KH 125 and although I haven't been riding long so don't have much exerience of other bikes I have to say my experience of this bike is pretty good. First thing my brother said is you shouldn't have bought a 2 stroke (after I bought it) but apart from a bit of soldering it hasn't really been any problem it starts in all weathers and for a 25 year old bike it goes quite well. It returns between 80 and 100 to the gallon and although intended as a round town commuter it did the 140 mile journey from North Suffolk to Kent quite happily. Can't really comment on handeling as I have nothing to compare it to but it seems pretty good for what it is. All in all personnally I think for what it is it's not a bad little bike and would I recommend it? yes. I never owned one but one of my friends at 6th Form had one of the early ones (15HP Round Headlight). It was a pretty bike, styled in the manner of the KH250s which had just become obsolete (slow compared to the RD250F and X7s) but which had a certain charm all of their own. Whilst the top speed wasn't amazing its pickup & mid range were very strong (up to about 50mph). We rode it two up around town a few times and it managed quite well despite my friend being heavy. Performance wise it didn't seem to mind too much but the handling was pretty poor. One day I gunned it across a busy rode from a standing start and was suprised when it lifted the front wheel for quite a distance - my friend used to lean back on his topbox so it wasn't as hard as it might seem... Even in those days it wasn't outright fast compared to some of the alternatives (e.g. RD125s, CB125T2s) but it did seem to have a real gutsy character all of its own. In my opinion, this is a good first 125, ideal for the daily commute or as a learner bike. It copes with the daily boredom of commuting but still does not fail to thrill when you put your head and open the taps. Its lightweight makes it easy and fun to throw into corners and its suspension and chassis (despite being vary basic) cope with all conditions with ease. It just inspires confidence in all conditions and when you are being a total spanner on it, there is a little bit of understeer to frighten you into easing off. The motor is fairly gutsy for an old 125, developing 12bhp and an easy top end of 75mph on the dual carriageway, so you will be able to hold your own in traffic. Reliability can be an issue if certain areas are neglected (it eats spark plugs like theres no tomorrow) and you can find your self stuck at a set of lights after the motor cuts out. However, take regular care of this bike (this bike is not for the rider who is not confident in basic motorbike mechanics), treat it with the same love and affection you would treat your dog and it will reward you with a long, happy life, full of surprises.